On the Zodiacs enroute to shore. 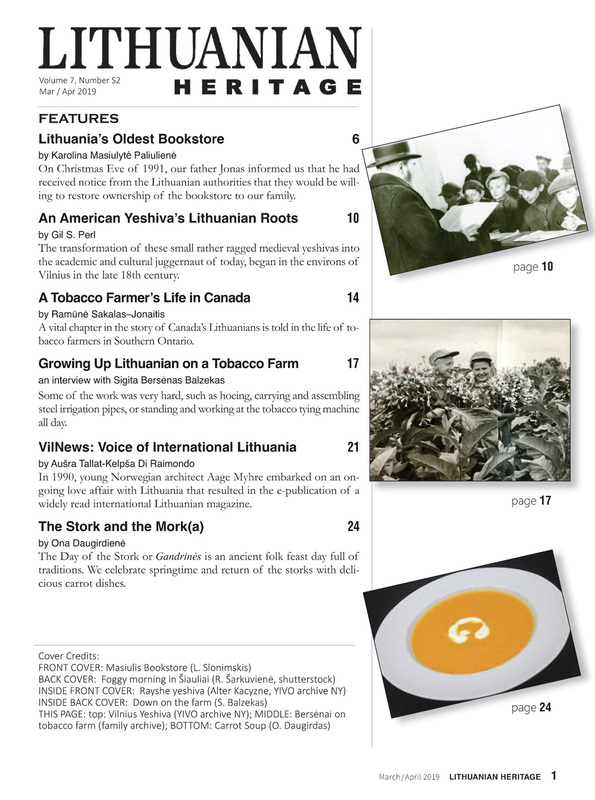 Lithuanians claim to have gone global. They now live in all corners of the world, bar one – that vast stretch of earth that is beyond everyone’s grasp – Antarctica. Except for an odd research station or temporary expedition hut, Antarctica has no permanent structures, no towns, no Lithuanian settlements, no inhabitants; it’s an icy unpredictable wilderness. 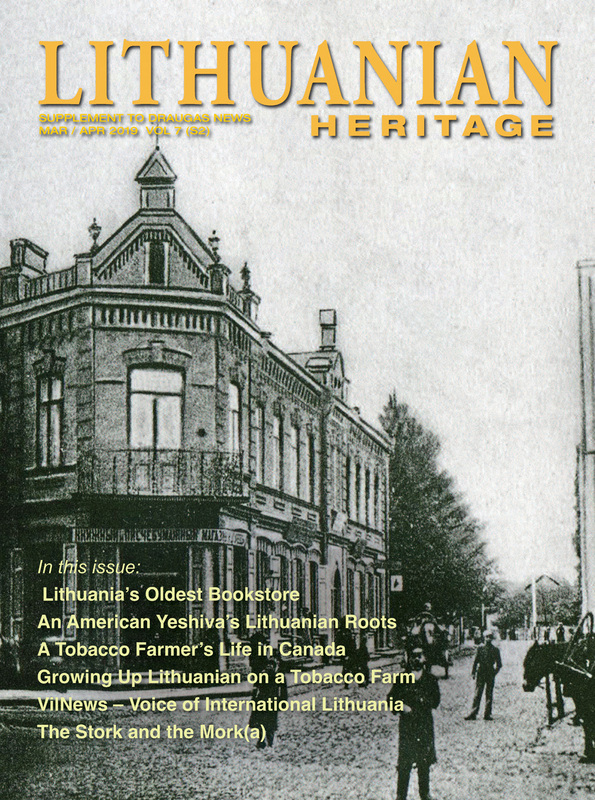 You can’t live there, but it doesn’t stop Lithuanians from visiting. Draugas columnist Alex Vitkus, relates how he and his wife Dana travelled to the bottom of the world some 15 years ago. 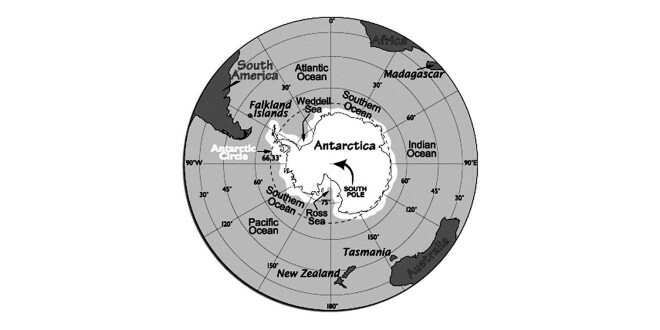 Today, December 19, finds us beginning a new adventure, a trip to the seventh continent –Antarctica. My wife Dana has long dreamt of this trip. She had read all of the adventure stories from the early explorers such as James Cook, who in 1773 circumnavigated Antarctica but failed to sight land, to Estonian Fabian Gottlieb von Bellingshausen, a captain in the Imperial Russian Navy, who in 1820 became the first person to come upon the Antarctic continent, to the heroic Norwegian Roald Amundsen, first to reach the South Pole in 1911, and Englishman Robert Scott, who was just 33 days behind. Scott’s disappointment turned tragic. His return trip was fraught with frostbite, scurvy, starvation and ultimately death; he and his crew were overtaken by a raging blizzard and they all perished in a tent just 11 miles from a supply depot. These tales of exploration, triumph and woe, as well as an appreciation of natural wonders and arctic fauna bolstered Dana’s resolve to explore this forbidding continent for herself. I agreed to come along. This Can’t Possibly be Earth! Imagine a place as big as the U.S. and Europe combined, sunnier than California, yet colder than the freezer compartment of a refrigerator, drier than Arabia, higher than the mountains Switzerland, and emptier than the Sahara. That is Antarctica, the strange but beautiful continent at the foot of the globe. 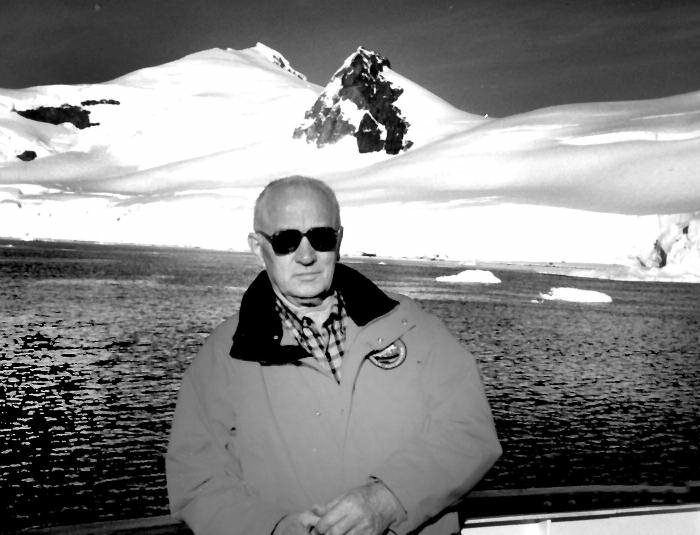 Author Alex Vitkus in Antarctica. Antarctica has arguably the most prolific marine life on the planet. Creatures here live, breed and migrate in staggering numbers. Walking among, say, half a million penguins is an experience no visitor will likely forget. But, contrary to a popular thinking, Antarctica has no mammalian predators, such as bears, wolves, fox, or humans. What does survive in Antarctica lives mainly on the coast and sustains itself with food from the sea. Antarctica is like no other land: there are no trees, no indigenous populations, and despite an abundance of coastal life, there are few species. Although global warming prognosticators predict that this great white continent of snow will eventually melt, in all seriousness we knew that it would not affect our travel plans. Nonetheless we didn’t delay; we wanted to do it while we were still in reasonable shape. We signed up for the expedition, fully understanding that this was not to be a typical leisurely resort-style tourist cruise on a glitzy ocean megaliner with formal dinners, heaping piles of food, midnight buffets, music, dancing, and gambling. Loveboat it wasn’t. We decided on nature sailing and selected a company that ran a small unpretentious 122-passenger expedition vessel with an ice-strengthened hull, small enough to approach the shore and explore secluded waterways that were beyond the reach of bigger ships. No tuxedos, just T-shirts… and parkas. Dana Vitkus: Visiting the frigid south – a dream come true. 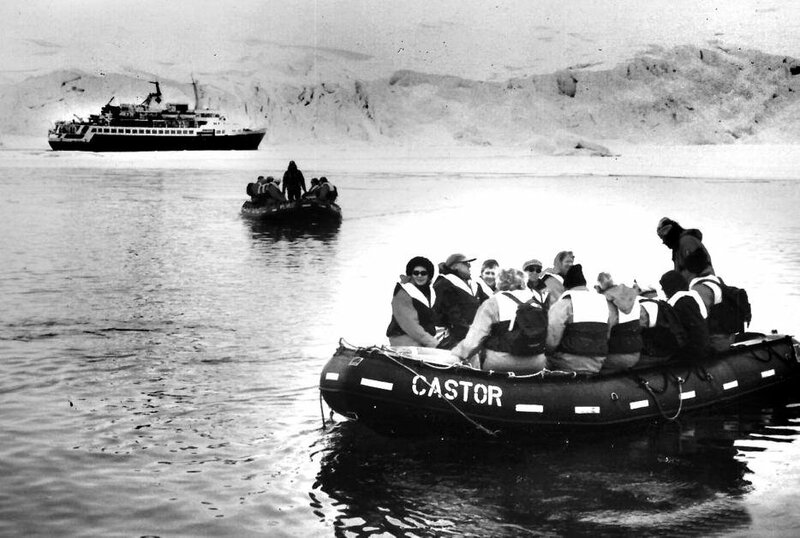 The vessel included a fleet of specially designed inflatable landing craft called Zodiacs that would allow us to land on deserted beaches, explore narrow iceberg-clad waterways, and step ashore to see wildlife. The ship’s staff included a naturalist, a wildlife biologist, a geologist and an historian, who would give on-board lectures. That was exactly what Dana and I were looking for. We flew from Chicago to Miami and then boarded a plane to Buenos Aires, reputedly South America’s most elegant capital. We had been there before, about 20 years ago, and found this city immensely grown, and yet still full of European charm. After a two-night respite, we continued our trip to the southernmost town in the world, Ushuaia, the capital of Tierra del Fuego, flying over snowcovered mountains and deep blue waters. The weather was overcast and drizzly, but it didn’t dampen our spirits. We boarded coaches and passed through the grim but wildly scenic Lapataia National Park down to the southernmost point of the Pan American Highway to our ship. Our cruise and expedition staff greeted us and we had a drink in the main lounge before being led to our sleeping quarters. It was great to finally be in our cozy cabin that we would call home for the next 11 nights. 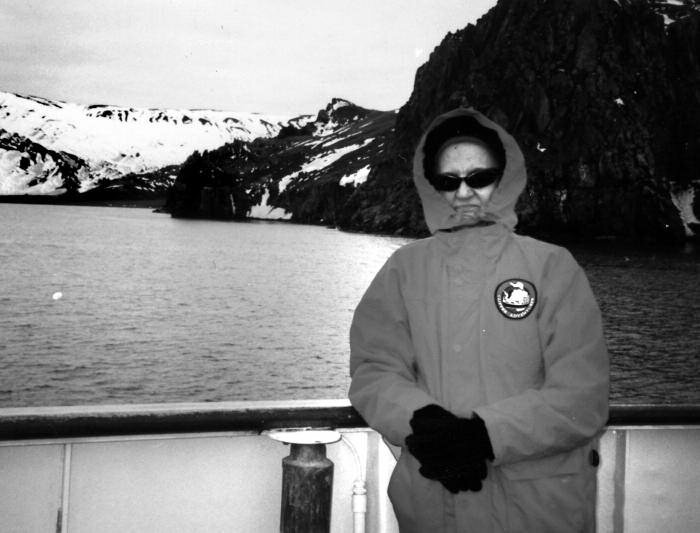 On deck, viewing the Antarctic continent. Our ship was built in Yugoslavia in 1975 for the Soviets to serve as a research station. The life jackets still bore the original “Leningrad” label. With the collapse of the USSR, an American company purchased the ship and refurbished it in Denmark as a cruise ship, naming it “Clipper Adventurer.” It now had a German Captain and officers, American and Filipino support staff, and a crew of 78. The ship itself was rather small, only 328 feet long, 4,376 tons, with a 14.5 knot cruising speed. With a draft of only 15 feet it could maneuver in and out of small bays where big and faster cruise liners would not fit. And yet, we had a lounge with an adjacent bar, a dining room, a gift shop, a small gym, a library and even a beauty salon. The dining areas were window-lined so that the outside world was always in view. There was an observation platform directly below the bridge for a view of the passing scenery. If that wasn’t enough, the Captain and his officers maintained an open bridge policy to give passengers an opportunity to observe their actions and ask questions. Life on board was casual and completely unregimented. In between the three daily meals there was always available complimentary hot coffee, tea, soft drinks, and snacks. Cocktails and beer were priced very reasonably. After an excellent first dinner, we enjoyed the calm seas in the Beagle Channel and were treated to a glorious sunset over the spectacular snow-clad peaks of Cordillera Darwin. Argentina’s Tierra del Fuego could be seen on the port side. We sailed along the channel towards the Antarctic peninsula – the 700-mile long finger that points to South America – passing several lowlying islands where sea lions played. Albatross and gulls shadowed us in the fading light. Occasionally we would spot a humpback or fin whale coming up for air and spouting water. You can identify them by the shape of their spout, fins and flukes. In summer they feed in the plankton-rich Antarctic waters, while in the winter they travel to lower latitudes to breed. They grow to a length of 80 feet. Fin whales are fast swimmers, and easily outdistanced our ship. The sun finally set, but the sky never got much darker than a confusing pale blue. Around midnight the ship began to pitch. This was a tell-tale warning that we were entering the rough and dangerous 600-mile long Drake Passage separating South America from Antarctica. The winds increased to over 40 knots, and all through the night our possessions were tossed about our cabin. We could hardly sleep. The next morning the dining room was deserted; nobody wanted to think about food due to rough seas. Winds increased to over 50 knots. By 11:00 a.m. we were told to keep to our cabins, as it was dangerous to climb the stairs. The crew delivered sandwiches and drinks to our rooms, while the ship doctor made “house” calls. Later in the afternoon I tried to have a bite and relax in the lounge, but not for long. Just a few minutes of the ship’s pitching and rolling, had me rushing to the nearest bathroom. As the trip progressed we began to encounter ever increasing numbers of sea birds and mammals. This was a clear sign that we had entered the Antarctic convergence, an area where the warm tropical waters flowing southward mixed with the cold antarctic currents. This created a perfect breeding ground for plankton and shrimp-like organisms, about four inches long, called krill. They, in turn, provided a bountiful feast for whales, seals, squid and penguins. Christmas Day the seas were calm. In the early morning we made our very first landing on Livingston Island. Although our ship was not very large,it was still too unwieldily to approach the shore. Besides, there are no docks on Antarctica. We had to depend on our Zodiacs, to bring us close enough to disembark into the shallow swell and surf of the shore. To keep the cold water from penetrating, we donned elaborate outfits starting with numerous layers of thermal underwear, waterproof rain pants, rubber knee-high boots, mittens, sun protection. On top of everything we wore heavy red arctic parkas. Life jackets were de rigueur while in the Zodiacs. Waterproof backpacks protected our binoculars, camera gear and all-important extra pair of dry socks. Before each excursion we received a briefing on what we were about to see. Then we would separate into small groups and climb down the stairwell outside the ship into the inflatable rafts. This trip to shore took some five to 10 minutes, depending on the weather. Roaming around the Antarctic in an open Zodiac was exhilarating, especially when a 30-degree spray of water would hit your face, but climbing out of the inflatable boat, bundled in all that gear, was a little tricky, especially in high surf. It reminded me of the D-day beaches in June 1944, except that here nobody was shooting at us. Once ashore we were free to explore. We took long walks and saw four different species of penguins: Chinstrap, Gentoo, Macaroni and Adélie. 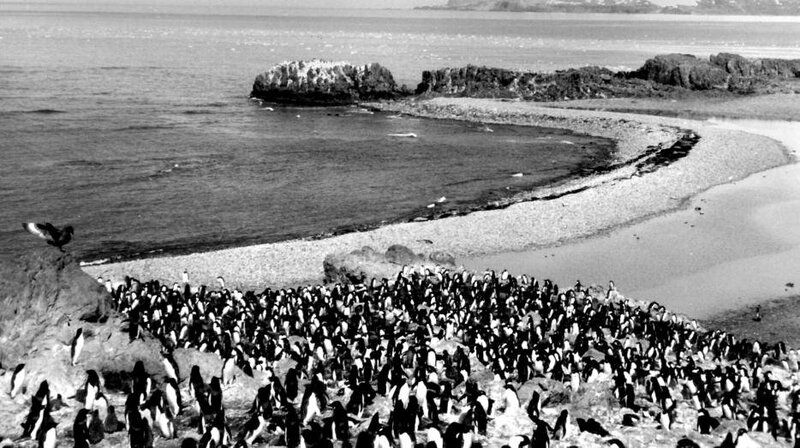 These were not just a few penguins, mind you, but vast rookeries of several thousand. Penguins are flightless birds, better adapted to life in the water than on land. Many of the penguins had hatchlings and their plaintive cries demanding food could be heard. We were instructed to stay at least 15 feet away from the birds, but apparently the penguins missed that memo, because they often approached us and sometimes even brushed against our legs. The harsh realities of Antarctica were not hidden from our view. We witnessed a skua bird attacking a penguin chick and further down a large Elephant seal lying dead in the surf. He was being worked over by a number of giant petrels, sometimes known as vultures of the sea. I could see tears rolling down Dana’s face – part emotion, part wind-chill – and I myself felt a tingle going down my spine. Over the next few days we were making landings at various islands, but only twice did we have a chance to actually plant our feet firmly on the Antarctic continent. At the Waterboat Point in Paradise Bay we visited a Chilean research station Gonzalez Videla. There we spotted a Weddell seal on an ice floe. These seals can grow to 10 feet; they are fat and are considered to be archetypical animals of the far south. At the scenic Neko Harbor we saw a few hundred pairs of Gentoo penguins resting on the steep slopes. Like most of the other species, they were black and white but they have striking orange bills. We had to climb through deep snow to reach their high rookery site, and we had significantly more trouble than the shorted footed feathered friends. Perhaps most intriguing was the sight of penguins bustling about as if with a great sense of purpose. Especially the Chinstrap penguins scurried urgently about on what looked like a small, penguin interstate highway. We were especially glad to land at Neko Harbor because it was on the Antarctic continent itself. 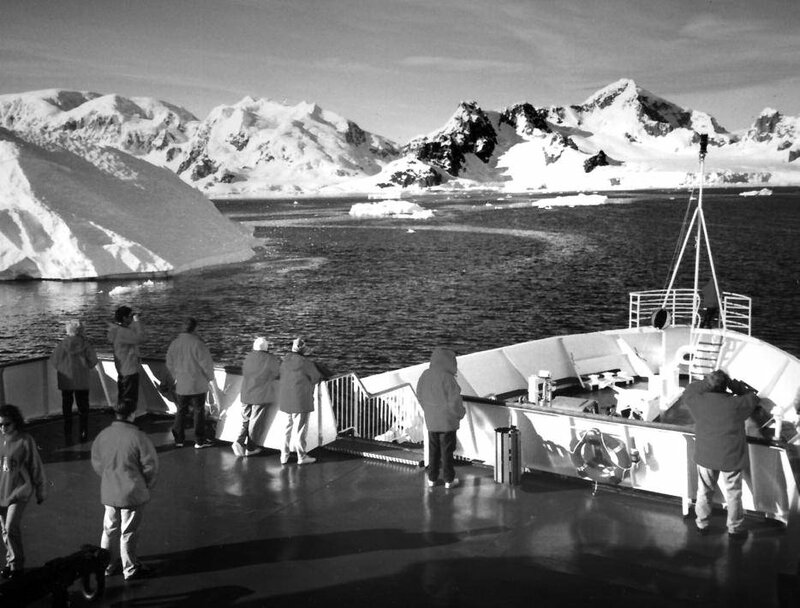 Cruises mostly sail only the Antarctic peninsula, which has a basically fjord-like coast and islands. So we could officially “bag” this immense rugged seventh continent with its 18,500-mile long coastline. The views were spectacular: we saw glaciers with ice cliffs formed of blue ice and deep cracks and crevasses. Port Lockroy, is a former British military base, established in 1944 and reopened as a museum and visitor center in 1996. Here we mailed a few postcards to our grandchildren, which they should receive in only a few months, as the cards first travel to the Falkland Islands, then to England, and only then on to the United States. At Port Lockroy the captain hoped to drop anchor and enjoy a calm night. The harbor, however, was still partly covered with fast ice. So, instead of anchoring, the Captain drove the ship bow first into the ice! Two Britons from a nearby research station walked across the ice to the ship. Watching their progress, we knew we would not dare repeat their performance as they were sinking down to their knees in several soft spots. A flimsy gangway was dropped, and they climbed the ship to join our outdoor barbecue party on the boat deck. The air temperature was an unbelievably balmy 40F. We were told that the highest temperature in Antarctica ever recorded was 59F, while at the South Pole it never got any higher than 7F. The lowest temperature ever recorded in the world was at the Russian Antarctica station Vostok – minus 127F, while in the Northern Hemisphere the lowest temperature ever recorded was minus 90F in some upper reaches of Siberia. The next morning we went ashore again and inspected whale bones strewn across the rocks. Most of the Gentoo penguins were sitting on eggs. We observed a Leopard seal catch a penguin just off shore. Leopard seals grow to 12 feet and weigh up to 1,000 pounds. They are fearsome predators feeding on smaller seals and penguins. There is much folklore about the dangers of Leopard seals perhaps mostly untrue, however, given their size and formidable jaws, caution was recommended. 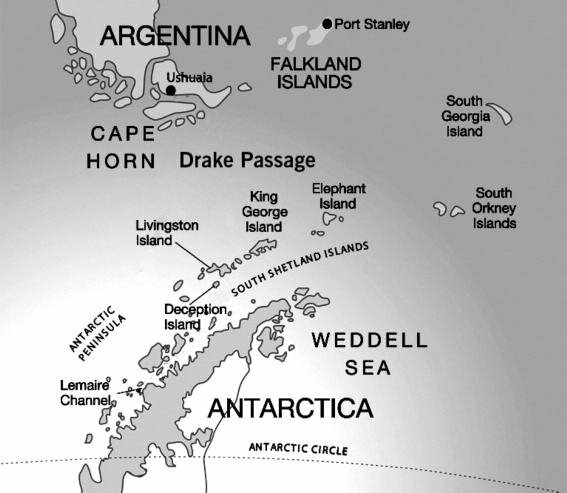 By December 30 we were again in the open sea, heading for the dreaded Drake Passage. Fortunately, this time the Drake was more like a “Drake lake” rather than a “Drake shake,” with light easterly winds giving uncharacteristically calm conditions for these latitudes. By the second day the winds increased to 22 knots. On December 31, with the Falkland Islands looming just over the horizon, we awoke to a strong breeze and a slight ocean swell – conditions more usual for the Drake Passage. Before dark we were able to fit in a brief landing at New Island, one of the 200-odd islands of the Falklands archipelago, called the Islas Malvinas in Argentina. Those who went ashore were treated to a fantastic golden sunset, behind the towering bird cliffs. Some of the locals joined us, to bring in the New Year in style. With free drinks flowing, most of the passengers joined in the boisterous chicken dance that looked more like penguins flapping their flippers. The next morning, still feeling a bit groggy after our noisy New Year’s celebration, we went ashore for a long walk in the drizzling rain to explore Albatross and Rockhopper penguin colonies. Rockhoppers are small and have yellow tassels. After lunch, the ship sailed to Carcass Island just seven miles away, where a school of playful dolphins quickly joined us. Walking to a distant settlement through the rain we were greeted by a myriad of wildlife including Magellanic and Gentoo penguins, Kelp geese and Patagonian ducks. Returning to the ship from our last landing we were again escorted by a pair of acrobatic Peale’s dolphins. The captain’s farewell speech and final dinner followed. On January 2, we finally docked in the Port Stanley harbor. With the wind blowing at 28 knots, our Captain had trouble maneuvering the ship into a narrow gap alongside another ship. It took well over an hour to tie up the ship to the short wharf. So ended our memorable Antarctic expedition. We thought Antarctica was one of the most beautiful places on earth. We spent nearly two weeks in gripping attention and awe observing its gigantic icebergs and ice shelves, penguins, seals and whales, and also its vast emptiness. We checked off one more destination on our roster of obscure places we have visited, but, as one tour leader put it, Antarctica is “highly addictive.” So much so that Dana has already started dreaming about flying in and going deep into the huge antarctic continental polar plateau and possibly experiencing at least one overnight stay at the South geographic pole! 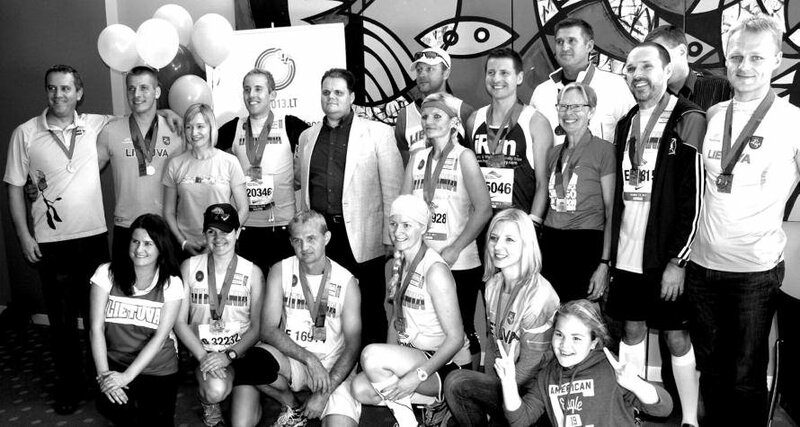 Lithuanian american team members with gen. Consul Marijus gudynas after the 2013 Chicago. Because of the long time it took to dock, there was hardly any time left for the ladies of the group to shop. A quick glimpse at a strikingly large cathedral dating from 1892, and a photo of a nearby arch made of whalebones, was all we could fit in and we were on our way again. En route to the airport, we viewed the streets and pubs which looked as if they were transported from Victorian England. We arrived at the somewhat grim and uninviting military base (there is no civilian airport), full of military restrictions, for the three-hour flight to Santiago, Chile, beautifully situated in the shadow of the majestic Andean mountains. In Santiago, we stayed at the sumptuous Hyatt Regency hotel to rest and relax and enjoy an outdoor swimming pool in long forgotten 90F weather! The same evening we left for the airport for a late evening flight to Miami, FL. Even before boarding we learned that a blizzard in Chicago was causing havoc. Here we go again! Fortunately, the flight was uneventful, and we landed in Chicago with much less delay than we expected.